Many companies are convinced that the market for new products has become increasingly bi-polar, split into high tier (high price) and low tier (low cost), with the middle market drying up. This would be exemplified by the Porsche driver who always buys her groceries at a high-end delicatessen, and the driver of a cheap import who always shops at a discount super market. As a result, companies believe they have to decide to turn one way or the other—either aim high, or aim low. Yet in the aftermath of the "customer revolution," in which consumers have grown increasingly explicit about what they want (which is not yet what they necessarily really need) simply aiming high or low isn't the smart strategy. While it used to be sufficient to offer a product spectrum tiered into high, medium and low, today's offerings have to be carefully targeted at sharply defined customer segments in order to be successful; the entire notion of a linear feature-to-price ratio no longer exists (it still does for feature-to-cost, though!). As a prominent chief marketing officer quipped to me the other day, "Tiering doesn't work anymore." Traditional "tiering" works through color, finish, materials and feature sets; for example, real aluminum is used for high tier, painted plastics for lower tier products. (We talked about tiering with authentic vs. synthetic materials in an earlier Design Mind column. New technological features are initially introduced in high-tier products, then mature down to commodity features over time—for example, anti-lock brakes. Those tiering mechanisms are now pass . Many execs see the middle market fading. Take razors, for example—the addition of three- and four-blade razors on the high end where a single replacement shaving head costs more than a set of five from the cheap use-once-and-throw-away models. Indeed, a recently published McKinsey report (McKinsey Quarterly 4/2005; The vanishing middle market by Trond Riiber Knudsen, Andreas Randel, and Jorgen Rugholm) demonstrated that mid-tier growth rates lag substantially behind the average by 7 percent per year. So, for the gadgets we ll see in 18 months to 2 years from now it shouldn t be just high or low anymore; companies have to really understand what makes a winning proposition to individual customer segments even before they know it themselves sometimes. At the same time, consumers struggle to be conscious (and honest) of their needs, which is necessary to select precisely the right product. Some industries learned decades ago that products had to be designed for future customer segments and specific applications: Mercedes expansion of product offerings from limousines to convertibles (adding SLK and CLK) to SUVs (G, M), compacts (A, B) and family vans (Vito, Viano, Vaneo, R) is an example of a targeted product range. They always maintained the high-tier pretense and targeted customers with very specific needs before tiering into SMARTs, Chryslers and Maybachs. Modularization is another approach to targeting individual customers needs. Take a look at the PC industry. Here, the consumer s need to define a matching product has spurred an entire industry of "shopping consultants"—PC product configurators and neighborhood stores—who help buyers make educated choices and configurations for their PCs. Other industries cannot exploit such targeting techniques; airlines, for example, could only add low-frills city lines initially, before finally going low cost all the way, like JetBlue and Southwest. Others, such as Lufthansa, upgrade their services value by adding designated first-class terminals and tiered frequent flyer lounges for Silver, Gold and Black frequent flyers. However, envisioning airlines that target specific customer segments beyond business travelers only, such as singles or outdoor enthusiasts, might be a fun exercise. Hooters Air in the US could be considered such an attempt. The trend of research-based customer segment targeting has slowly trickled through all mass-production industries, arriving at integrated high-tech gadgets such as laptops, cell phones and handheld GPS devices. More features and more performance do not translate into competitive advantage for large customer segments anymore. This creates a big shift in the industry, which has grown on the idea of one size fits all . Ironically, the largest targeting success in the handheld GPS market, Dutch TomTom s Go, was succeeded immediately by a string of merely tiered derivatives (300, 500, and 700). It appears now that they did not actually pursue a targeted approach in the first place but quickly learned from their consumers. TomTom could arguably be attributed with creating a new market when they perfectly targeted the casual GPS user such as soccer moms and driving-for-pleasure-retirees with their conscientiously friendly, not-too-technical products. This starts with the outside of the packaging - the cool black cube with the black lacquered maze on it appeals to more style-conscious buyers rather than the typical technology-driven user. It continues to the friendly, potato-shaped housing of the product without all those numerous (i.e. scary) buttons and a cool (and costly) aluminum logo on the back. 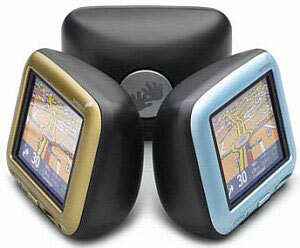 Other GPS vendors quickly followed into this new market, introducing ever more targeted, casual GPS devices (including the game console Gizmondo). TomTom seems to have realized their wrong turn and recently added two targeted devices, a weatherproof unit for motorcyclists and a portable slim line model. Only the 700 is highly advertised; the other tiered versions 300 and 500 can be found at discount stores in Europe. The value promise for the targeted consumer comes from a very specific and balanced mix of features and attributes or services which represent value for that consumer, like the camera in a waterproof housing, the ability to play games with a phone or the seamless integration of a media player with an online music store through the home computer (we know to whom I am referring). Gadget producers have to look outside their home turf to find those winning combinations which create a rewarding, holistic experience for consumers, be they technical features, feature/service combinations, or purely emotional content. Customers are quick to learn that making a purchasing decision tiered solely on their initial budget alone will not yield a rewarding and loyalty-creating experience. Companies who do not go the extra mile today to understand their customers conscious and unconscious needs will waste time, money and resources developing boring products. Today you see Porsche drivers being proud of their discount bargains and you see meat and potato -Joe enjoying a latte macchiato tiering simply doesn t work anymore. Dr. Michael Schachler is frog design s head of Business Development for Europe. He has worked in leadership positions related to product development for US software firm PTC and Management consultancy McKinsey in Europe and Asia before joining frog design.